Alcatel today made its Idol 4S with Windows 10 smartphone available unlocked from the Microsoft Store. 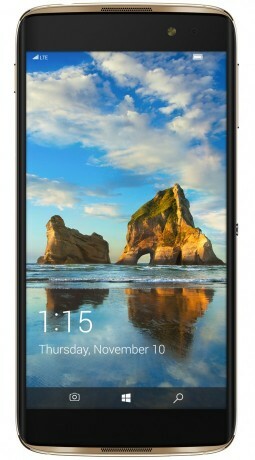 The Windows Idol 4S has a 5.5-inch full HD display, Snapdragon 820 processor, 21-megapixel camera, and USB Type-C. Other features include a wide-angle 8-megapixel selfie camera, 3,000mAh battery, 4 GB of RAM, 64 GB of storage, stereo speakers, and a rear-mounted fingerprint sensor. The Idol 4S with Windows is compatible with Continuum, which enables it to act like a full PC with the proper accessories. The phone is compatible with the networks run by AT&T and T-Mobile. The Idol 4S with Windows 10 costs $470.